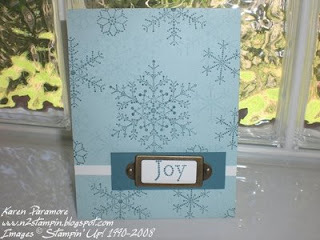 N2 Stampin': My Christmas In July Samples! 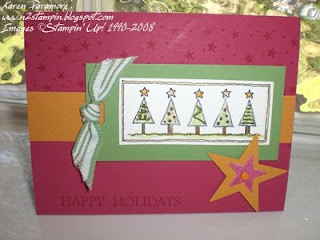 I wanted to share these 4 cards that we made at my "Christmas In July" Stamp-a-Stack last month. This will be my last post of retiring stamp sets since you can't purchase them from the catalog anymore. Each of these cards featured retiring Christmas sets. 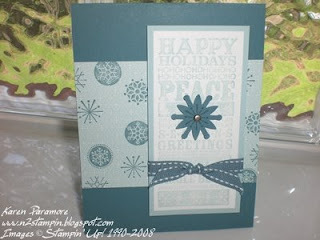 The card above with the snowflakes uses a couple of the sets that retired. They are "Snow Flurries" which I love and "Block Party". This card features "Festive Favorites" which was always a fun set to use. This card uses "The Snowflake Spot". It is sad to say but this is a set that I had for a while and this was the first time I inked it up. Shame on me because it is a very pretty snowflake set! 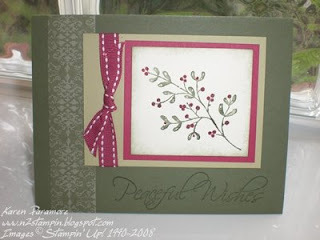 This card uses the "Peaceful Wishes" stamp set. This was one of my favorites and I am sad to see this one retire. It was nice because it was simple stamping but gave you an elegant look. Hopefully these cards will give you some ideas on layouts for other Christmas sets to use if you don't happen to have any of these sets. Okay, so now it is time to get the new catalog posted on my blog and I hope to get a few samples for you to see later today or tonight. Stampin' Up! is also having some great specials right now that I will post later too!